Coachella’s 2015 lineup was just released and other than Florence and the Machine touring for the first time in ages, St. Vincent, and a few bottom ticket acts like Benjamin Booker and Ryn Weaver, I have to say I’m very underwhelmed. I find many of the lower ticket acts are actually the best, i.e. Lykki Li, MØ, etc. Yes, AC/DC is absolutely and undoubtedly incredible and everyone has been hoping for Drake for ages, but listing bands like Alabama Shakes as a second tier headliner and Jack White as the main headliner for Saturday night is a bit disappointing. Half of these acts just performed at other festivals like Newport Folk Fest, and therefore, the lineup is barely giving us anything new like the Outkast reunion of last year. Musicians like Hozier are wonderful and all, but should they really be considered ‘headliners’ at a renown festival like Coachella. I love many of the acts, but I just find the lineup a bit lackluster. 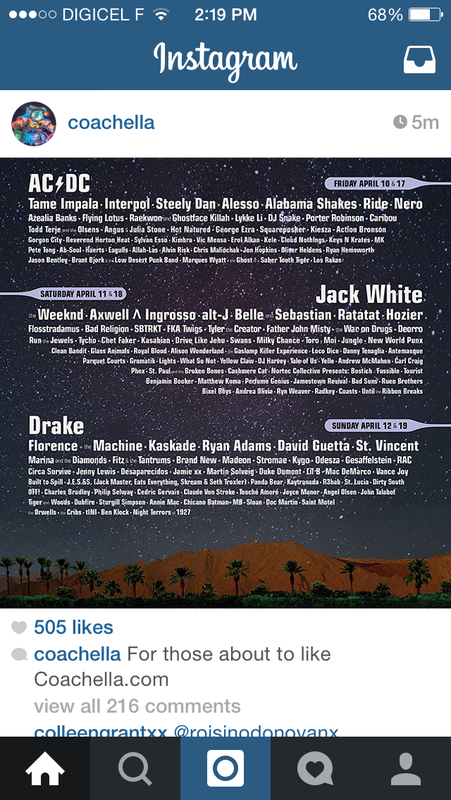 This entry was posted in Uncategorized and tagged Coachella, Festival, lineup, Music. Bookmark the permalink. I was looking into it, but I feel like it’s not worth it this year! Im definitely going to go in the near future though!